Humans are a pretty predictable bunch; unless you live in someplace like Iceland or Alaska, most of us sleep when the sun goes down, and get up to work or play when the sun is shining. Most of our eating and drinking is done during that time too; after all, we’re awake — so why not? As a result, we tend to perform most of our horse chores during the day as well. We muck out, ride, groom, and yes — feed — our horses primarily between the hours of 6 a.m. and 6 p.m. After that evening feeding, we turn the lights out in the barn and head inside, assuming that our horses will sleep soundly until morning, when they’ll be calling for breakfast. Because we like to think our horses follow the same schedule that we do, many people think that horses need less hay at night because they’re asleep (and therefore, not eating). However, that’s a myth. Horses need access to forage at all times of the day. Most humans aim for 8 hours a night of sleep. Horses don’t operate like that. Horses are awake and moving virtually all the time. 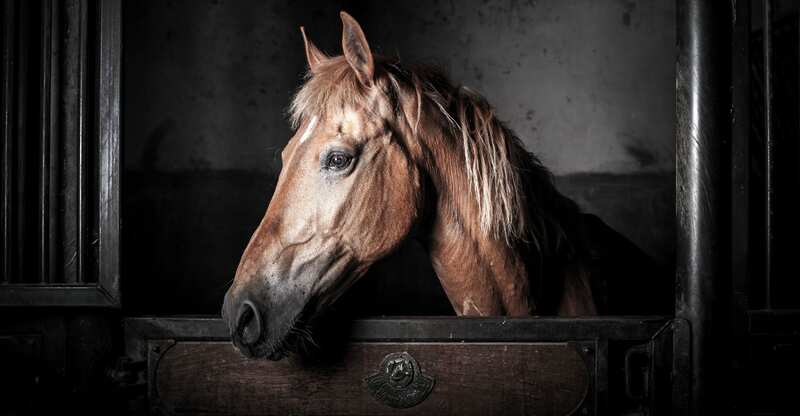 Mature horses will sleep up to two hours per day, broken into short periods. These 15 to 20 minute naps are intermittent throughout the day and night. In other words, horses do not sleep for any length of time like other animals do. It’s easy to see why horses evolved in this way; in the wild, horses take turns sleeping, in order to always have at least one set of eyes looking out for predators. But even in the safety of the barn, this evolutionary habit remains. And it profoundly affects the way horses eat and digest their food. Quite simply, when horses are awake, they get hungry. And unlike humans, who tend to eat three big meals throughout the course of the day, horses need to eat constantly. A small, frequent intake of forage helps buffer the acids naturally present in the stomach and aids in digestion and absorption of nutrients. Because the horse’s stomach is quite small, he needs many smaller meals throughout the day to help food move through the stomach, small intestine and into the hindgut. 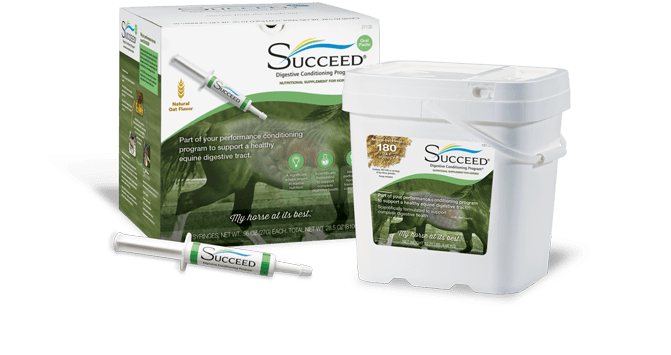 Horses are trickle feeders, designed to graze continuously to keep the digestive system functioning normally, thereby preventing ulcers and colic. Feeding them in sync with their natural instincts and physiology requires that they have forage available any time they want it — and that means 24 hours a day, 7 days a week. Combine the horse’s digestive needs with his sleep schedule, and it’s easy to see why he’s banging down his stall door for his morning meal. He’s probably hungry, which can cause stress for a horse. 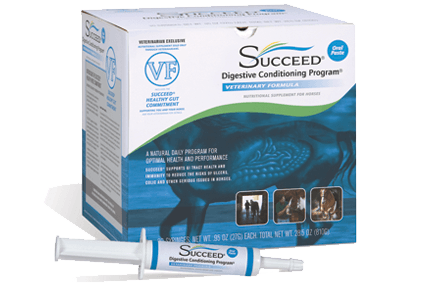 An empty belly may also be painful for your horse, as he won’t have anything in his stomach to help buffer stomach acids. Additionally, he’s likely to bolt his next feed, which could lead to undigested starch reaching the hindgut — and possibly lead to digestive imbalance. How do I Know if I’m Feeding my Horse Enough? The way you can determine how much hay to feed at night is to make certain that there is some hay left over in the morning. If your horse runs out of hay and you wake to find him kicking and pawing, he is hungry. But more than that, he is in pain (due to the acid bathing his stomach) and he is mentally stressed. This stress can lead to a multitude of health problems and, ironically, it can prevent an overweight horse from losing weight. The solution? Constant forage. If your horse can be turned out around the clock on pasture or with hay, perfect. If not, give your horse more hay than he can possibly eat during the night. Once he realizes that the hay supply will never run out, he will start to self-regulate his intake and actually begin to eat less than he used to because he has calmed down, both physically and emotionally, Getty concludes in her article. High-quality forage like hay should be the main staple of your horse’s diet. Be sure you’re feeding the right balance of forage to pellets or other hard feeds (hint: prioritize forage always! ), and that you’re feeding it in a safe, clean environment. Most importantly, remember that hay is for horses — at all times of the day and night.